Set on the banks of the mighty Zambezi, Royal Zambezi Lodge provides a superb mix of photographic safari and excellent fishing for tigerfish. The camp has 3km of river frontage and borders the Lower Zambezi National Park and sits within a game management area. The area is one of outstanding natural beauty and has a unique ecosystem. Teeming with fish, the river supports a truly astounding bird population. Reed banks and islands are home to elephant, buffalo, lion, leopard, hippo and zebra, amongst countless others. 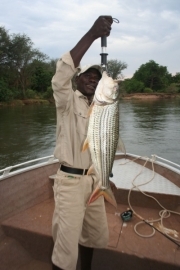 The Lower Zambezi is the best place to experience excellent fishing for tigerfish. The optimum time is during the hotter months of October and November, just before the rains. Expert resident guides use fully-fitted aluminium boats to access the best parts of the river. Tigerfish are extremely aggressive predators that can reach 20lbs plus, however a fish over 10lbs is considered a specimen. The Lower Zambezi around the Lodge is a perfect habitat for these fish, so it is normal to fish around the Lodge in the evening and go further afield during the day. Fishing is normally from boats, but it is possible to fish from the many islands in the river. Nine foot rods, normally for an 8 or 9-weight line, are ideal when matched with sinking lines and clousers in various colours. The tackle requirements are straightforward and do not take up too much luggage space, making it a perfect trip to combine with further travel in Africa. Until you hook a tigerfish you will find it difficult to understand the strength of these fish. The take is explosive and the fight is made up of blistering runs and one jump after another. Skill is required to read the water and the good fish tend to lie where there are drop-offs from sand bars or close to the banks where trees have fallen in the water, providing habitat for their prey. Combine these amazing fish with an audience that usually includes elephants, hippos and buffalos and you can appreciate what makes this such a unique experience. There are ten classic suites which are complete with ensuite bathroom with flush lavatory, large showers and a shady veranda. The large, green canvas tents nestle under mature trees and are positioned for maximum enjoyment of the surrounding views and complete privacy. Extra-length, sprung mattresses, pure cotton linen and feather pillows ensure a blissful night’s sleep. There are four luxury suites which are the epitome of the luxury safari experience. In addition to the amenities of the classic suites they have outside showers, copper baths, plunge pools and private decks overlooking the river. In addition to the main dining area, dinner can be at a private table under the stars, on the private deck of your room or for a special occasion by candlelight on an island in the Zambezi. The resident chef uses the finest fresh ingredients to create a fusion of traditional and contemporary cuisine. 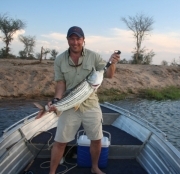 Excellent fishing for tigerfish from a luxury safari camp with the bonus of outstanding game viewing. Land packages are from $6,655 for a 7-night stay with shorter stays possible.